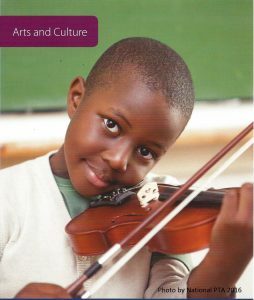 Involvement in the arts increases academic achievement. Studies have shown that eighth graders who are highly involved in the arts get better grades, are less likely to drop out and are more likely to attend college. Yet fewer U.S. students report receiving any arts education today than 25 years ago-and the declines are steepest among African-American and Hispanic students. PTA supports a well-rounded education for all students, including the arts as a core academic subject. DCCPTA is proud to run the largest Reflections Program in Florida, with approximately 300 student participants each year from around Duval County. In 2016-2017 Duval had three students that won Awards of Excellence at the National level. Way to go, Duval!!! Reflections is an easy, low-cost program to add to your local PTA this year. Contact our Cultural Arts Chair at Reflections@dccpta.org if you need help getting started. Congratulations to Duval County Reflections winners for the 2018-2019 school year. This year’s theme was “Heroes Around Me.” Three entries in each age group/art category are chosen as an “Award of Excellence” and are forwarded to compete at the State level. A special ‘thank you’ to all of this year’s participants for sharing your heroes with us! Another great way for students to get involved in the Reflections Program is the annual Theme Search. Encourage your student to brainstorm and imagine a theme that will appeal to other students. For submitting the award-winning theme, the student receives $100 and recognition at the National PTA convention in June. To submit a student’s suggestions for a Reflections Program theme, complete the entry form at FloridaPTA.org and send it to Florida PTA by October30.